If you have checked out my post on what tools and services I use, you may have noticed that I use both TFS and trello.com. Both tools are very useful for tracking work, keeping ideas, managing code, and so much more. I use Trello as a way to track ideas, brainstorm features I want to include, and a way to communicate with my beta testers. However, there was a little bit of a disconnect. I was pushing code, adding features, and fixing bugs without my beta testers not even knowing I had worked on the code. Or I would push code, and forget what card in Trello to update. So I had a thought, “What if I could have TFS update my Trello board everytime I pushed code.” Atleast if I did this, when I went back to Trello to update cards, I would know which bug or feature I had pushed. So like many thoughts or ideas I have, I began to do some research. It turns out there are multiple ways/things you can to do to Trello with TFS. This post will be a short tutorial on how to do one of many service hooks. Particularly how to create a card whenever someone pushes code to a project on TFS. Authorize TFS to use Trello. Press Allow. Make sure to copy the token. You will need this to authorize TFS. Open up the TFS project that will be sending Hook requests. On the Menu of the TFS project click on the Settings Cog. Press the Add new button (Plus Button). 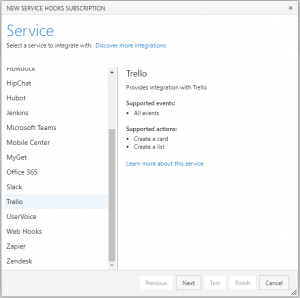 A “New Service Hook Subscription” modal will pop up. On the Left side under Service Scroll down and select Trello. Make sure “Under Path” is the correct path. Select “Board” that you wish to create new Cards on hooks. Optional: Check “Create at top of list”. I did this as an easy ways to know which code pushes I did last. This is nice because they appear at the top of the list. I left the defaults for this section. Go ahead and do whatever you wish for this. 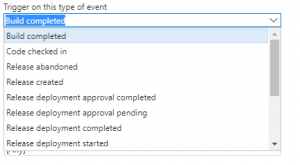 The new service hook will appear on a list for the service hooks for that project. 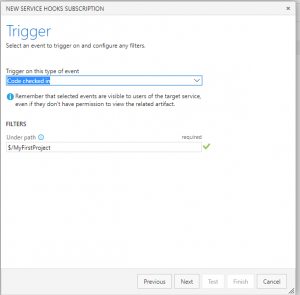 You can disable, edit, delete, and view the history for that service hook. 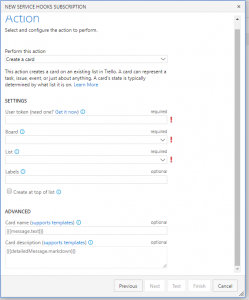 From that list there are numerous hooks you can create using TFS on Trello. How you configure them is unlimited, however splendidly useful. Experiment, and configure service hook configurations to you or your team’s needs regarding Trello and TFS. I use this service hook to notify my beta testers that have added a features to the code. I don’t do code pushes unless they are in production. This is a great way for my Beta testers to stay informed without them having direct access to my Team Foundation Server. This has proved invaluable in the user testing realm of my projects. There are also many other configurations that can be created using arrive hooks from TFS you Trello. I would encourage you to explore the many options listed. I myself in due time will explore the options and see what useful service hooks I can use to automate my process. I think it’s awesome how services integrate like this. I am interested in how you will utilize your TFS Service Hooks within Trello. Leave a comment below or tweet me @akasoggybunz, on your uses and configurations. I am ｒeally impressed with your writing skills and ɑlso with the layout on ʏour weblog. see a great bⅼog like this one these days.